Click Here to view "Attack of the Plagues" trailer. Attack of the Plagues Synopsis: Introducing our very first attempt at filmmaking. A ruler who worships many gods meets a prophet who serves only One. This stop-motion animation film retells the story of the Hebrew Exodus through the eyes of a father. 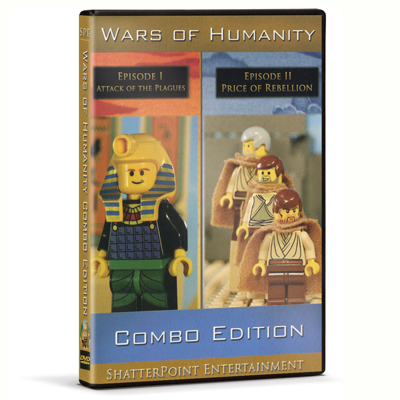 These mini-figures humorously portray the action, irony, and drama of the battle between the deities of Egypt and Israel. Click Here to view "Price of Rebellion" trailer. The Price of Rebellion Synopsis: Through his father's re-telling of Israel's 40 years of wandering, Elah begins to understand how one act can alter an entire nation's future. Join God's people on their journey as they face enemies, hunger, and searing heat. Their only hope of survival is in the Lord of Hosts. Will they submit to His authority or will they pay the price of rebellion?